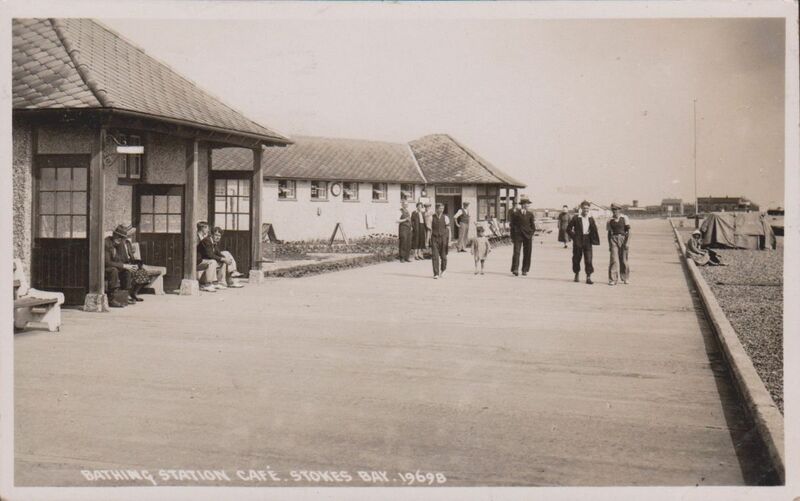 The Bathing Station and Tea House 1951. 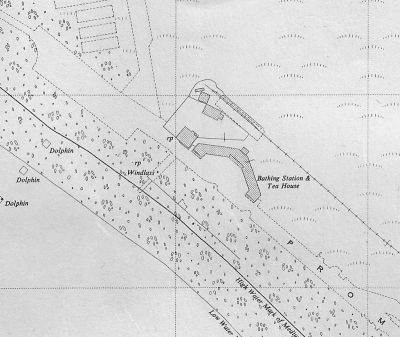 The D-Day Command Centre is to the west of the bathing station. The workshops for the miniature railway are behind. 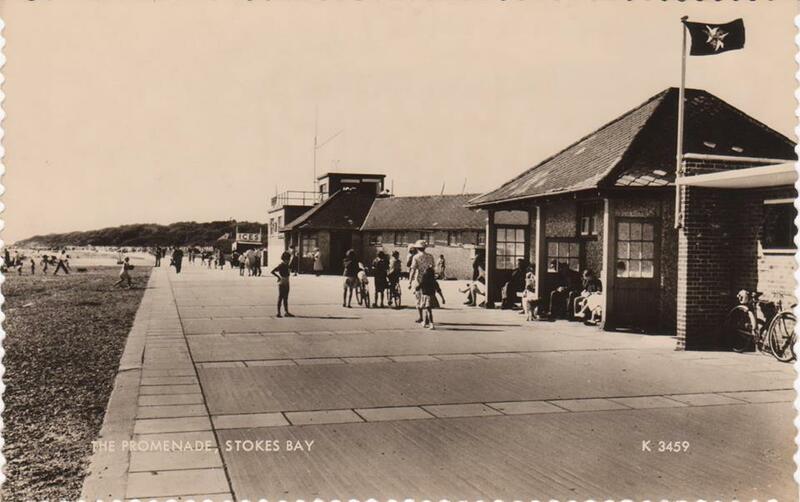 In 1922 the Government Unemployment Grants Committee of Gosport Council considered a scheme for concrete bathing huts and refreshment rooms at Stokes Bay and in 1923 the Finance and Parliamentary Committee authorised the borrowing of £1,750 to construct them. That same year one hundred and fifty deck chairs at 7s 6d each were purchased, fifty with canopies at 12s 2d each for hire at 2d or 3d (with a canopy) in the morning, afternoon or evening sessions. Twenty Four concrete seats were for the promenade were purchased at £2 1s 3d each. Mr Kite was approved as warden for the season at 50s per week plus 5% of all sums collected from deck chairs. 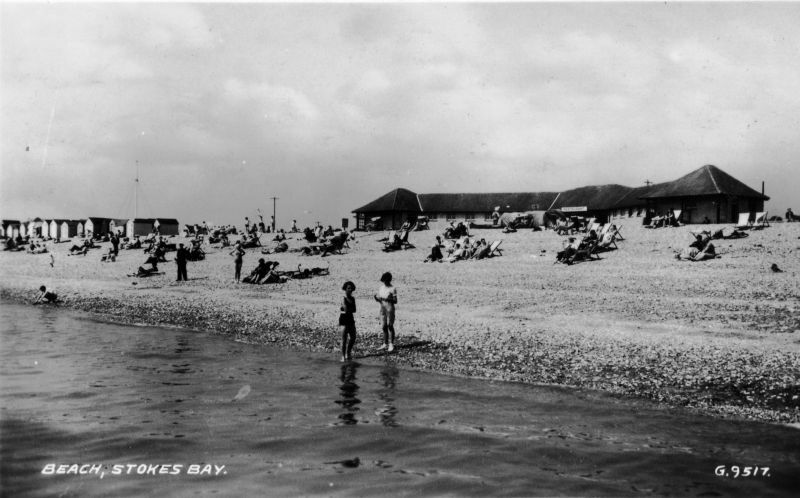 On 30th July 1923 the Council Minutes reported that the the Bathing Station would be opened from 4th August at a charge of 4d per person for use of a cubicle. Male and female attendants were to be employed. It was reported that by September 23rd. £1,600 of the allocated £1,750 had been spent on the Bathing Station. In 1924 the construction of the new promenade was approved. 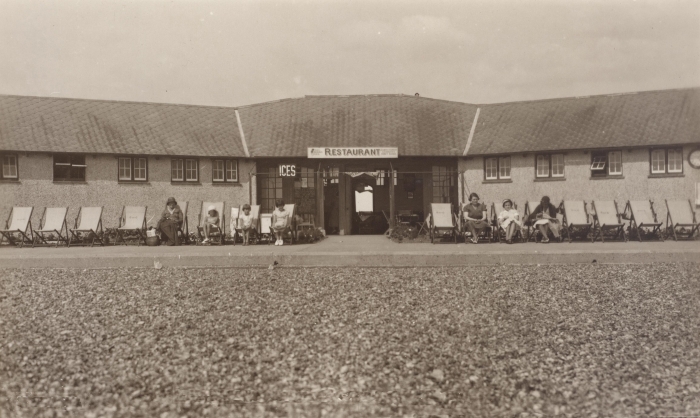 Also this year eighteen tables and seventy two chairs were purchased for the restaurant/tea rooms at the Bathing Station. Tenders were invited annually for the operation of the two restaurants at the Bay. Mr Hodgson offered £60 for the one at the Bathing Station. One hundred and four bathing hut owners were to have their private huts repainted (at their expense) in order to keep the painters occupied! 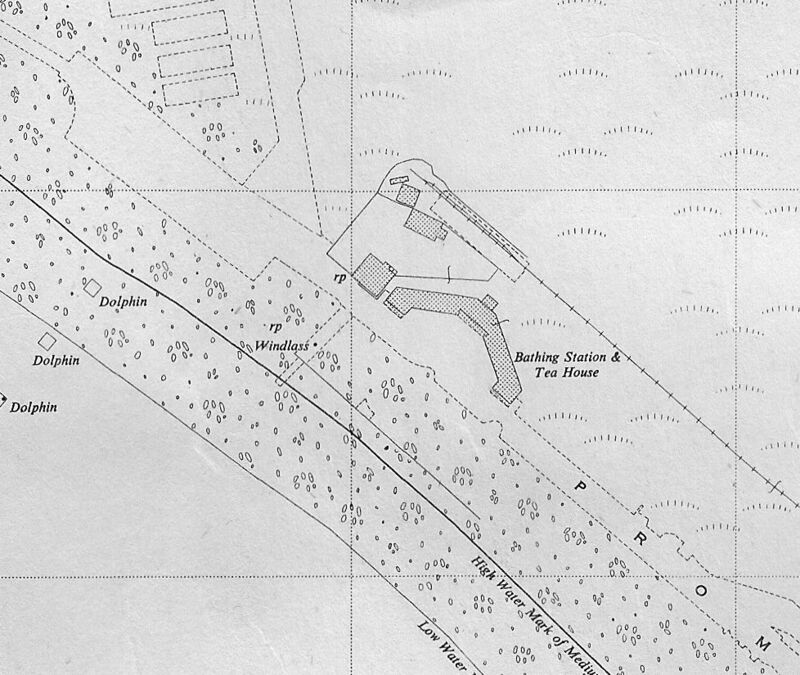 In 1926 fifteen more bathing hut sites were allocated from the esplanade to the coastguard station. 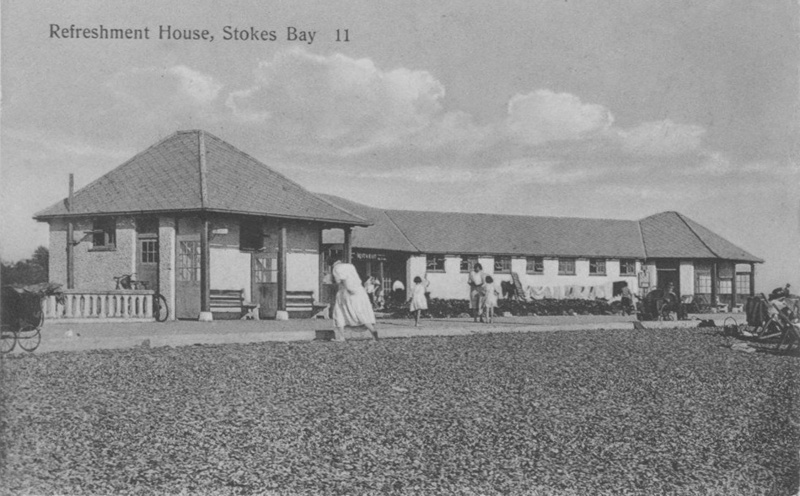 In 1927 it was decided to erect twelve more day huts at the Bay. In 1928 it was agreed that a waterproof clock would be erected in front of the bathing station at a cost of £25. Gas for the geyser, stove and lights at the Bathing Station leased to Mr Davis was approved. In 1929 another twelve day huts were approved due to increasing demand. In 1930 the Open Spaces and Watch Committee agreed to erect twenty four extra day huts in front of Col. Sloane Stanley's land. Col. Sloane-Stanley objected to them ruining the view from his house and it was agreed to move six of them. The Colonel objected to the huts in full view of his lawn and literally a stone's throw away. The Committee minuted to ignore him! He invited councillors to view the twenty four day huts. 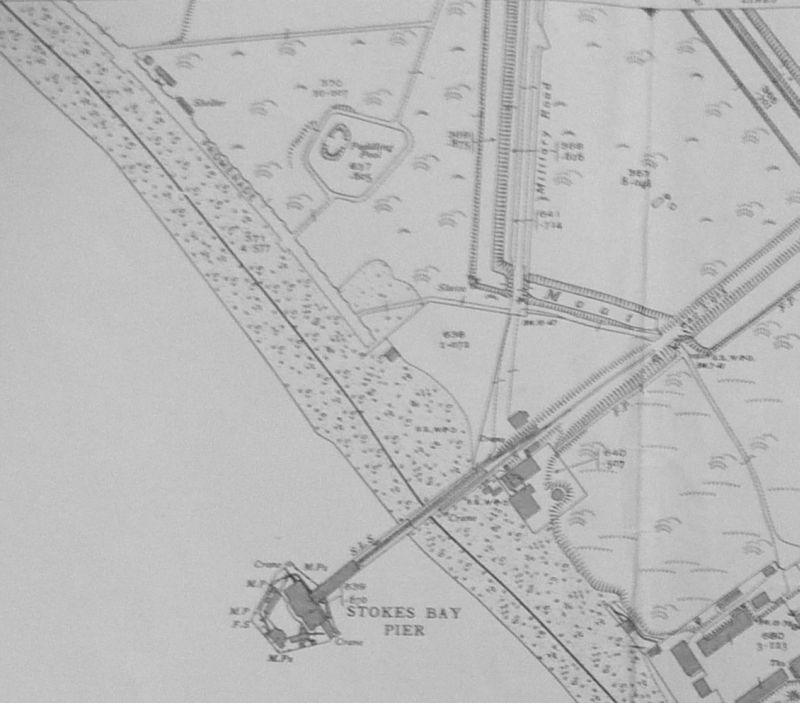 In 1942 the Admiralty requisitioned the bathing station, tea house and lavatories adjacent to No.2 Battery. A D-Day Command Centre was constructed at the west end of the bathing station in 1943 (now the Stokes Bay Sailing Club H.Q.) 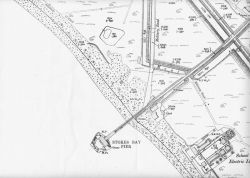 They were de-requisitioned in March 1947 and the whole of the bay was re-opened to the public, with the exception of the west end which was still to be used by the Special Armament Development Establishment based at Fort Gomer. Stokes Bay Bathing Station. 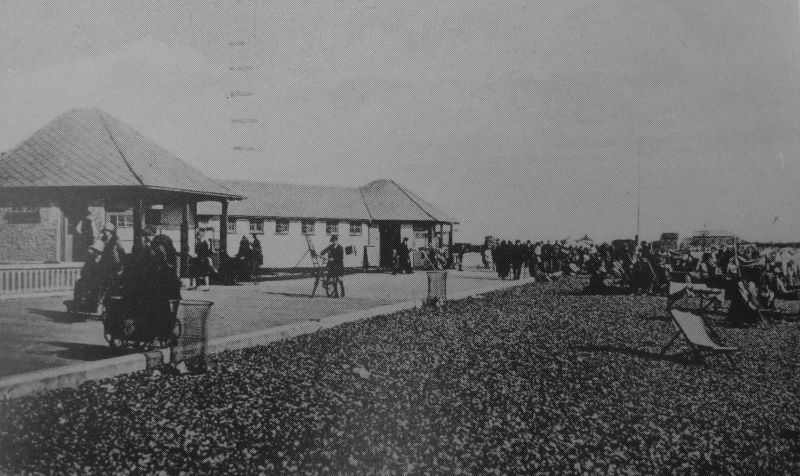 The Bathing Station circa 1939 prior to the construction of the D-Day Command Centre to the west. Stokes Bay bathing station. 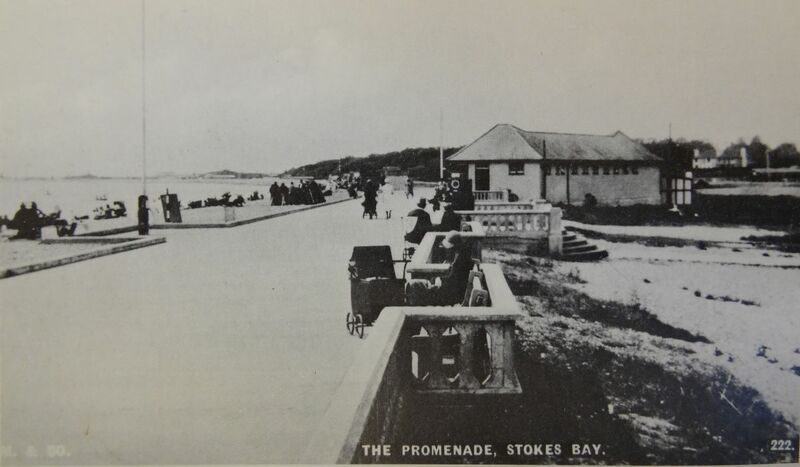 The Promenade circa 1950. The bathing station (Refreshment House) The bathing station looking east along the promenade. The bathing station viewed from the east promenade. Southern Miniature Railways Limited was incorporated in June1948 with the object to: 'acquire and carry on in particular the business of miniature railway owners and operators heretofore carried on by Frederick Albert Tubbs, George Vimpany, William Ernest Simmonds and Louis Hathaway at Gosport Hants. 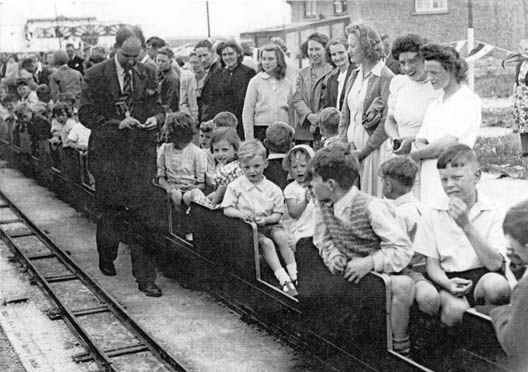 The miniature pleasure railway was built along Stokes Bay, with the agreement of Gosport Council, in 1948 by George Vimpany who proposed that it should operate for three years. It was run under the name Southern Miniature Railways Ltd, which also had railways at Poole, Bognor Regis and Southsea. It was run on a shared profits basis with Mr. Vimpany supplying the rails and engines (He had two Curwen standard 4-4-2locomotives 'Vanguard' and 'Valiant' numbered 1001 and 1002 built at Southsea based on Engine No1001 'Sir A Montgomery'.) and the Council providing the land. The Council expenses were £50 to lay a water pipe from the Promenade cafe (where the Pebble Beach Cafe now stands) to the brick building at the rear of the Admiralty control building, also two labourers for two weeks to prepare the site for the railway tracks. The brick building was to be converted to a railway shed and station. The Council were to take 25% of the gross receipts in the first year; fares 6 pence per child, 1 shilling per adult. The exact route is shown on a map attached to the Council minutes, but this has not survived. 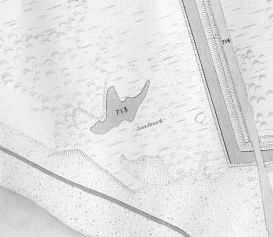 It is possible that it ran out towards Fort Gilkicker, around the paddling pool and then inland and back towards the Teahouse in a loop. A passing loop at the bathing station end allowed the engine to run past the carriages. 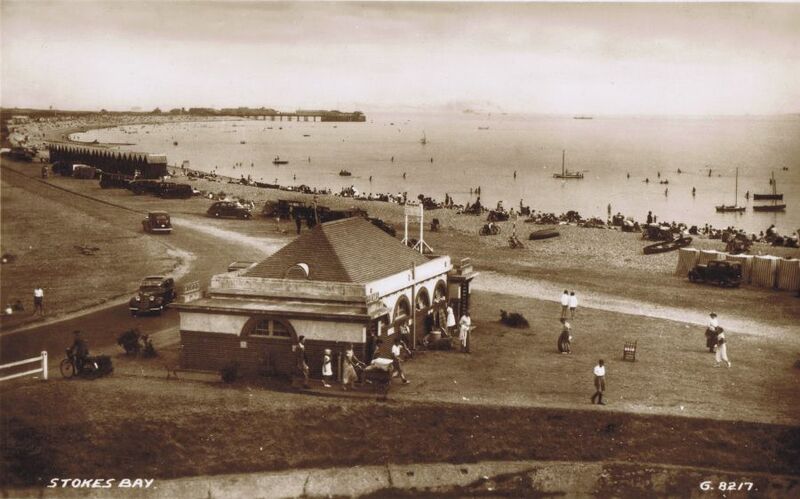 The line was taken up in 1951 and it has been reported elsewhere that this was due to complaints that it was unsightly and spoilt the view of the Bay. However the Council minutes tell another story. In 1949 Mr Vimpany wanted to run the railway again for another season but at the end of this year the Company informed the Council that it ran at a loss and the Council agreed to move it so as to develop the Bay. 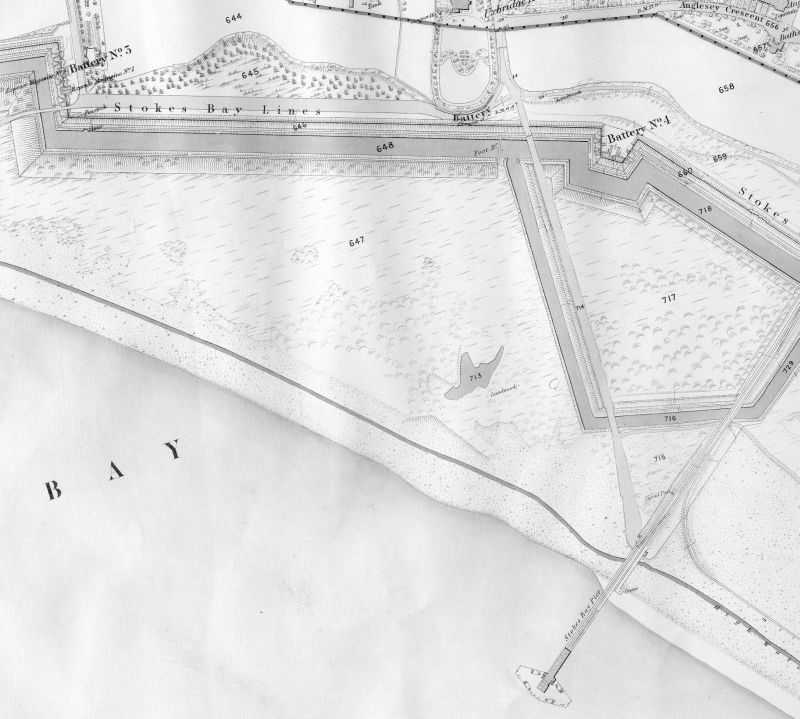 This development including the building of a causeway across the site from Bay Road to the new promenade, which would have bisected the railway. 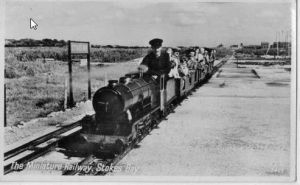 Your Committee have considered the proposal of Southern Miniature Railways Ltd. and are of the opinion the Miniature Railway should eventually prove a valuable adjunct to your Council's development plans at Stokes Bay, and that the Company should accordingly be encouraged to remain. Your Committee cannot, however, agree the Company's terms of operation for 1950. (a) Your Council to receive five per cent of the first £250 gross receipts. (b) Gross receipts in excess of the first £250 to be subject to a deduction of 20 per cent in favour of your Council. In 1951 the Council minutes noted that Southern Miniature Railways were to remove the railway at Stokes Bay as it had run at a loss for three years, but hoped to return when Stokes Bay regained its popularity. Presumably the extensive development of the Bay, including the commencement of the filling of the moats, had put people off visiting. Peter Keat, writing in 'Rails to the Yards', tells that Mr. Vimpany received a letter from the council informing him that the railway could be invited back at any time. 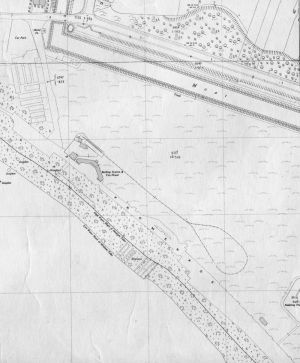 However shortly after the railway was removed the Stokes Bay Sailing Club wanted to extend 150ft to the north now that the railway had gone. So that was the end of the railway's prospects of returning. The line was 10.25-inch gauge. Mr Vimpany took the engine Vanguard to Poole Park. In 1990 the engines Vanguard, Victory and Valiant were bought by Stuart Ravell. All three are still running at Kirby Green Light Railway.Watermill Farm, Sleaford. The shortened route of the pleasure railway on a map of 1951. 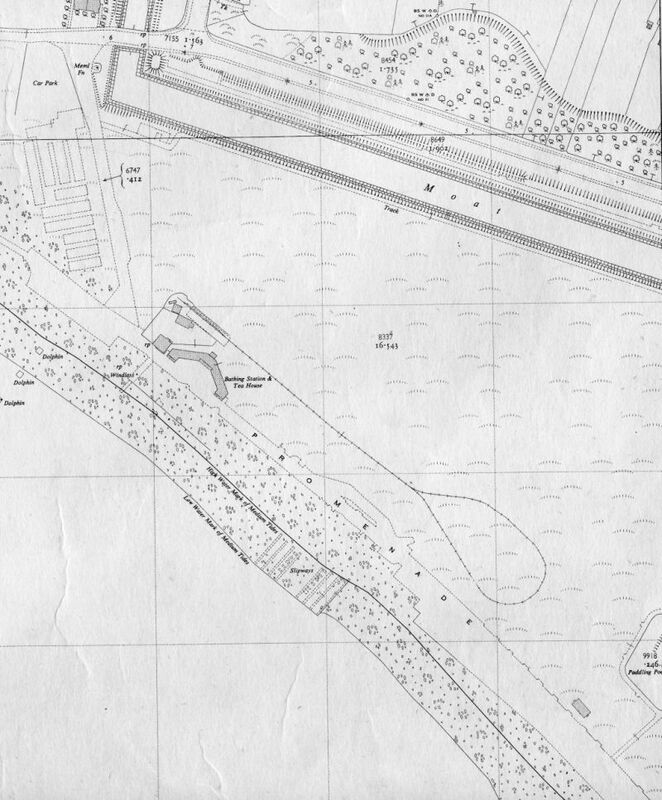 The newly proposed causeway was to run between the loop of the railway and the paddling pond.The D-Day Command Centre is to the west of the Bathing Station. 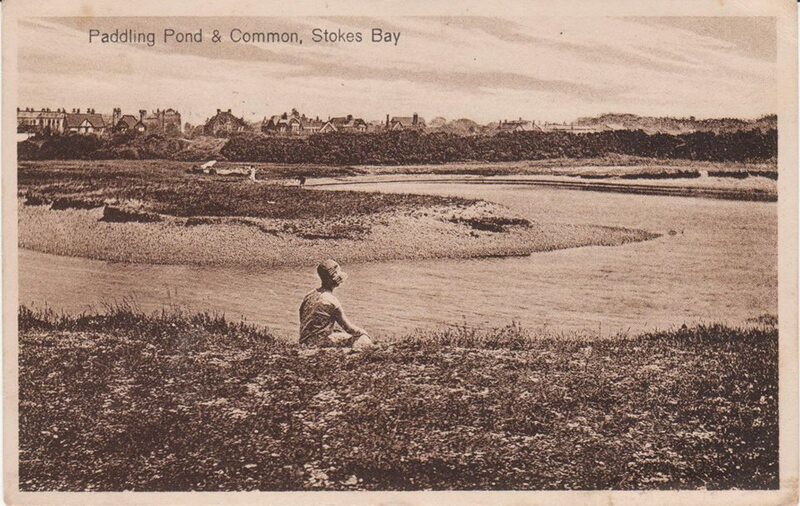 The River Alver flowed along the length of Stokes Bay parallel to the beach and exited into the sea near Gilkicker Point after passing through the Stoke Morass. 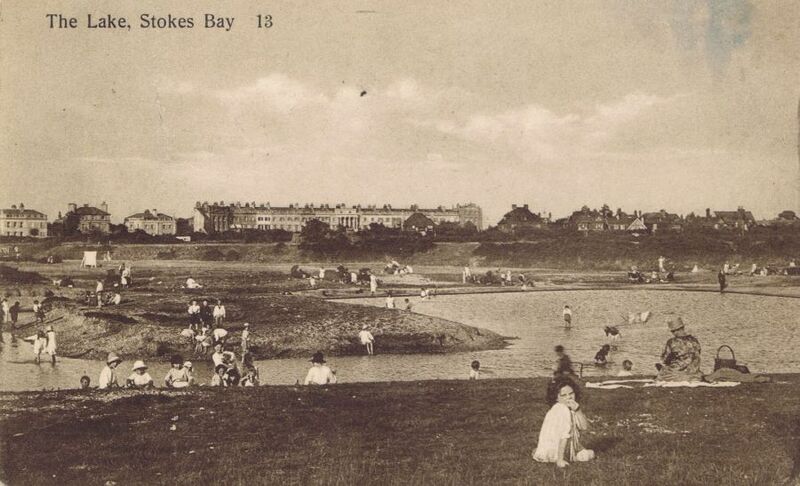 In the early 1800s the Royal Engineers diverted the River Alver, via a culvert, into Stoke Lake so that the morass at the Gilkicker end of Stokes Bay could be drained. Parts of the morass remained forming two small pools of water. In later years one of these was used by the local children as a natural paddling pool. 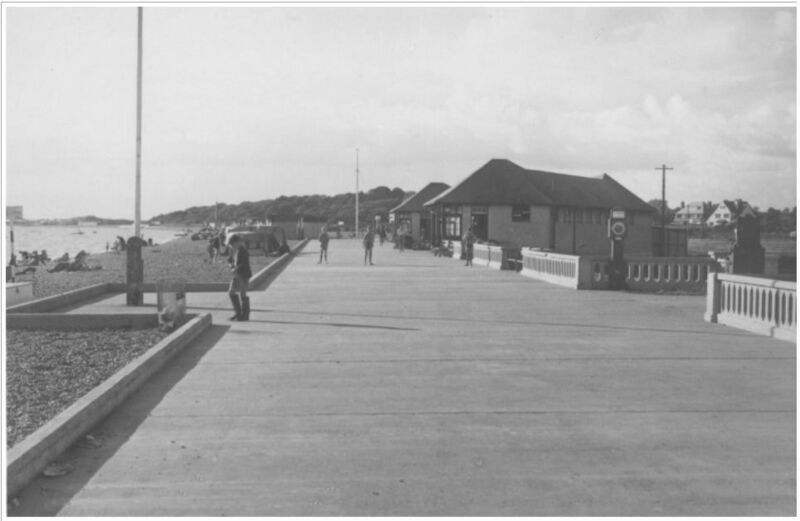 Gosport Council saw that it was popular and in the early 1930s provided a concrete path to the pool from the end of Anglesey Road. 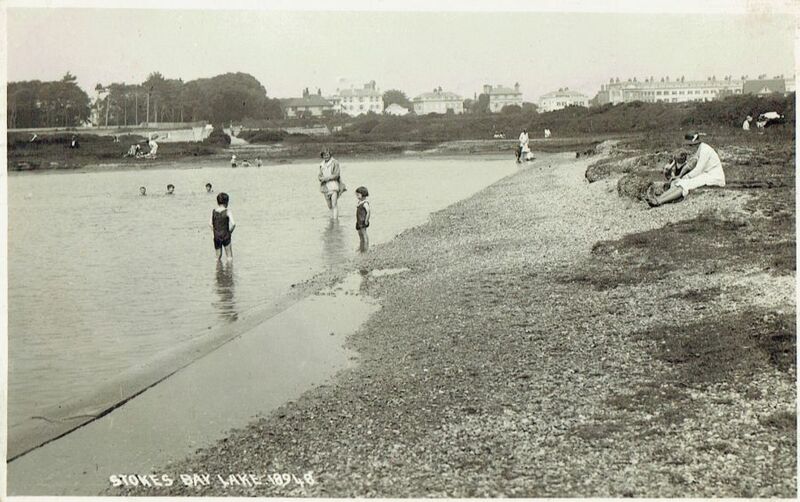 By 1939 the path was extended around the pool and on to the promenade. An island was formed in the middle of the pool. On the seaward side of the pool was a large outlet pipe, that emerged into the sea next to a set of concrete steps, presumably for draining the Paddling Pool. 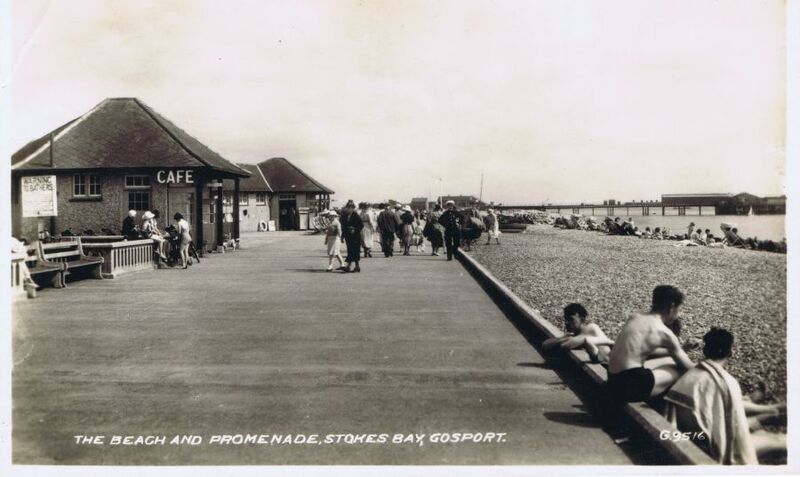 A Gosport resident remembers diving off the steps in the 1950s and swimming underwater to the pipe. Today all that remains to show where the pool was are the concrete paths across the field leading nowhere. Two brick plinths topped with concrete and now covered with earth can still be seen close to the path from the promednade to the pool. This may mark the penstock for draining the pool. The pool in 1927 to 1936. The Crescent can be seen in the background. Note the island in the middle, also shown on the maps below. By 1931 a path to the pool was provided from the end of Anglesey Road. The path to the pool in 2008. Looking towards the promenade and the sea. Looking towards Anglesey Road The path that goes nowhere. The promenade end of the path. The pool was filled by the council in 1961. According to the March council minutes, the Medical Officer of Health had drawn attention to the unsatisfactory reports made on the bacteriological state of samples of water taken from the pool. The reports indicated that the water in this pool had deteriorated since the previous year and the Health Committee had requested the Committee to take necessary action to bring and maintain the water in this pool up to a satisfactory standard. The Committee decided that due to the low lying nature of the land on which it was sited and the seepage which occured both at times of high tide and from storm water which collected on the surrounding land and eventually found its way into the pool, they should fill the pool and build a new one at another location. They had already tried to improve the water by putting in place a means of emptying and filling it, by clearing mud and silt from its bottom, by raising its level with the addition of clear sand and shingle and by repairing the existing concrete surround at an estimated cost of £280. The fitting of fiiltration plant was estimated at a further £2,750 on top of the cost of chlorinating by hand at £3,250. 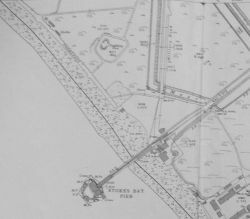 The Committee thought that the public use of the pool did not justify the outlay and a new pool was constructed to the west of the Sailing Club premises. A view along the Bay from the west end. Acknowledgement: Once again, I am indebted to Gosport historian Philip Eley for providing me with information after he painstakingly read through the Gosport Council minutes. This proved invaluable for connecting dates with events.